I learned a lot about teaching from my grandfather, Arch Warnock. When I was 12 years old, he taught me how to sharpen saws during a summer visit in Smackover, Arkansas. He found an old saw blade in his shop and that I couldn’t damage, loaded me up in his ’57 Chevy, and drove me to the hardware store. He told the owner of the store he needed a saw handle because his grandson was going to learn to sharpen saws. He attached the handle, showed me how to place it in the rack and then went to work showing me how to set the points and the proper way to file. He placed his hands on mine and led me through the process. Gradually he let me take over while continuing to coach and make adjustments. Then came the hard part…PRACTICE! He’d leave me to work on a saw and then return in an hour or so. He would test my work by cutting a quarter inch piece off of a two-by-four. After a few quick strokes and a look at the saw blade he’d scrape the tips off of the whole saw with two sweeps of a large flat file. This meant it wasn’t cutting right and I would have to do the whole saw over again. After watching me file and making suggestions, he left me to my work. 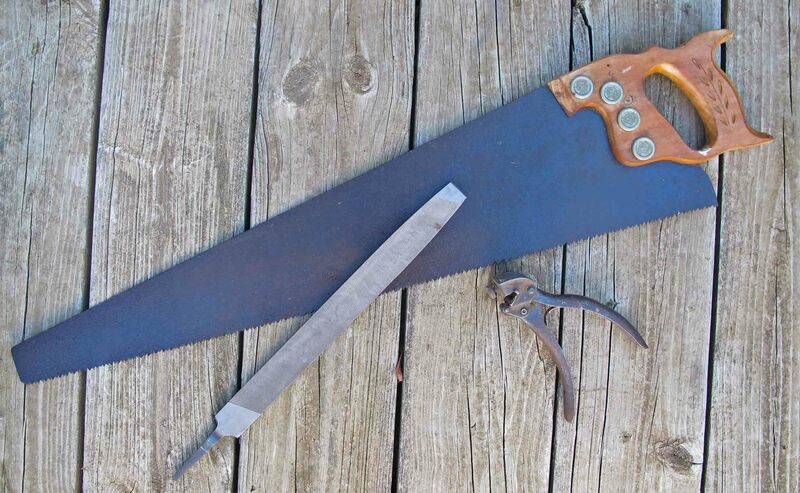 I’ve never forgotten the pride I felt as my grandfather proclaimed the saw would cut; that saw I sharpened would cut! This was an early taste of real self-esteem, the result of going through a struggle to learn something new, coming out on the other end able to do something that seemed impossible in the beginning. 1. He gave me a clear goal. 2. He set a high standard and believed I could meet it. 3. He coached and encouraged me. 5. He showed unconditional love for me regardless of my skill and celebrated my success. 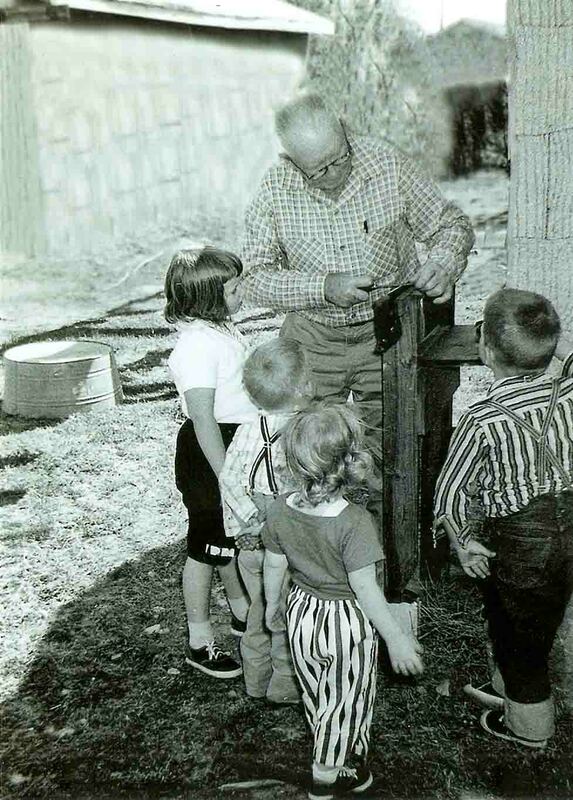 My grandfather sharpening a saw as grandchildren look on. I’m second from the left. I still treasure the saw my grandfather gave more than forty years ago. The saw my grandfather gave me. The small tool was used to set the teeth of the saw before filing. This entry was tagged Arkansas, Daily Prompt, Daily Prompt: Mentor Me, grandfather, learning, Mentor Me, practice, school principal, Smackover, teaching. Bookmark the permalink. Cousin Jim, I remember when this picture was taken. I am next to you on the left. It was fascinating to watch Grampie work! Loved your story! He would indeed be proud of you! We were very fortunate to have such a good man for a grandfather! Really enjoyed this, Ozarkmountainhiker, I liked your voice throughout the piece. I’ll be writing on this prompt today, thanks for suggesting it! Thanks for the kind words. Glad the prompt is meaningful for you. I really liked how you listed what you learned from him. I do a lot of mentoring at work and I think your grandfather was right on with how he taught all of you. I hadn’t particularly paid attention to this prompt, but I agree with Jennifer that I’m glad I saw how you handled it and will give it a try myself.